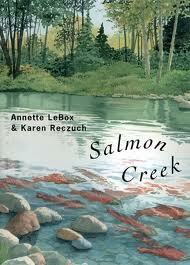 Salmon Creek, written by Annette LeBox and illustrated by Karen Reczuch mesmerized us this week. Nothing is quite as amazing as the life cycle of the Pacific salmon. I still remember the sounds of rushing water, the visuals of a stream bed of red and the smell of cool, damp earth as I stood watching the salmon spawn in my own childhood. We aren’t studying salmon right now but we have been reading from a large variety of information picture books with themes of Canadian animals and endangered species to practice questioning and inferring and this book seemed an ideal pick. I couldn’t have predicted its powerful effect in the classroom. The poetic text and gorgeous illustrations lured us quick and fast into the amazing journey of Sumi from the beginning stirrings in her egg to her life as a fry, then a smolt and eventually to her own return journey to the spawning grounds of her birth creek as an adult female. And later, as she drifted gently downstream, Sumi sang to her eggs . . .
Home is the scent of cedar and creek. Home is the journey’s end. We manage the sadness when Sumi dies as LeBox does such a wonderful job of explaining the full circle of life and with our new understanding of the amazing salmon life cycle, we feel peaceful and wise. This book includes a glossary in the back to help with new vocabulary, more information about threats to Pacific salmon and suggestions for further reading and viewing. Some of our unanswered questions from our very long lists! How fast does a salmon travel? Especially when they are travelling against the current? Are salmon fry see through? Do salmon ever interact with their siblings? How many eggs survive when the mother lays them? If salmon are now endangered, how many are left? What is in the yolk sac? How could they survive if the water freezes? Do they eat different things at different ages? When salmon are injured in the rapids, how do they heal? This book is one of my new favourites in the information story book category. This entry was posted in Non-fiction and tagged asking questions, Canada, endangered animals, information story books, nature, non-fiction by carriegelson. Bookmark the permalink.